1 square inch of color joy. Glowing mandalas to wear. 1.5 inches. Rainbow to go. 1.25 inches. Based on the Broken Dishes quilt block. 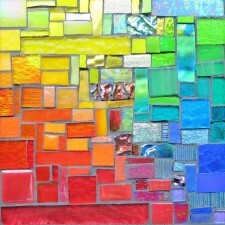 Glass tile, silver overlay, 1.6 inches. Inspired by improvisational quilting. Glass and ceramic, 1.6 inches. Commissioned for a birthday gift, one color for each grandchild’s birth month, in the traditional Log Cabin Quilt Block form. 1 square inch of memory.